This Toolkit is a collection of resources to be used by planners, landscape architects, designers, and anyone working with DoPS. It has been designed as a set of individual tools and resources for practitioners to support their understanding and application of the DoPS Standard. Each of the resources is available separately, or combined in the Toolkit. Take what you need. An at-a-glance overview of what is within scope of DoPS and what is out of scope. It also addresses some common misconceptions about what is covered by the Standard and how to interpret DoPS. An at-a-glance summary of which sections of DoPS have technical and/or consultation requirements. A resource sheet to support the understanding and application of the Accessible Parking section of DoPS. It provides direction on how to calculate the number of spaces required and some examples. A summary handbook of all the requirements of DoPS organized by section. It includes a list of considerations, requirements and corresponding DoPS regulation section references organized in a table for ease of reference. A visual representation of the areas that fall within the scope of DoPS versus the Ontario Building Code (OBC) to provide clarity about which regulation to follow in different circumstances. 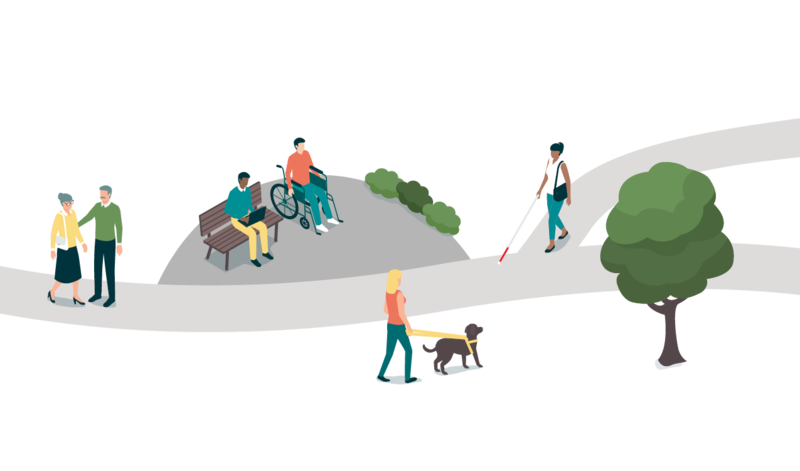 A handy resource showing DoPS in the context of other relevant accessibility standards and regulations. Five key areas of best practice that emerged based on practitioners’ experiences working with DoPS. A self-guided presentation to support understanding and applying the Design of Public Spaces Standard.